Breadfruit (Artocarpus altilis) is a species of flowering tree in the mulberry family, Moraceae, growing throughout Southeast Asia, South India and most Pacific Ocean islands. It is also grown in the Leeward Islands and Windward Islands of the Caribbean and in Africa. Its name is derived from the texture of the cooked moderately ripe fruit, which has a potato-like flavor, similar to freshly baked bread. 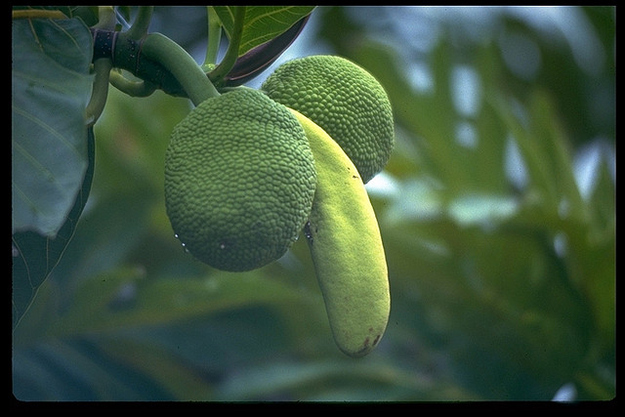 Breadfruit trees grow to a height of 25 m (82 ft). The large and thick leaves are deeply cut into pinnate lobes. All parts of the tree yield latex, a milky juice. Breadfruit is one of the highest-yielding food plants, with a single tree producing up to 200 or more grapefruit-sized fruits per season. In the South Pacific, the trees yield 50 to 150 fruits per year. In southern India, normal production is 150 to 200 fruits annually. Breadfruit is a staple food in many tropical regions. The trees were propagated far outside their native range by Polynesian voyagers who transported root cuttings and air-layered plants over long ocean distances. 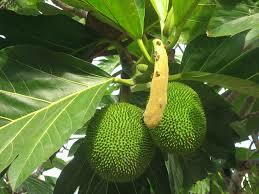 Breadfruit are very rich in starch, and before being eaten, they are roasted, baked, fried or boiled. When cooked, the taste of moderately ripe breadfruit is described as potato-like, or similar to freshly baked bread. Very ripe breadfruit becomes sweet, as the starch converts to sugar.